Abstract: I was dying (in 1999) from profuse nosebleed, constriction and spasm of the entire gastro-intestinal system. My muscles were wasting away and I had cramps and extreme chills. My brain was retarded and I was breathless. My weight dropped from 165 lbs to 112 lbs. After consulting so many medical experts and alternative practitioners, one would expect a proper diagnosis.That is what you would expect, right? Finally, after much painful research, asking, seeking, and knocking, I discovered the cause of my problem which all this while had eluded detection by those medical experts. Andrew S. C. Leong, N.D.
27, Jalan 2/13, Bukit Indah, Ampang. 68000 Selangor. I was dying (in 1999) from profuse nosebleed, constriction and spasm of the entire gastro-intestinal system. My muscles were wasting away and I had cramps and extreme chills. My brain was retarded and I was breathless. My weight dropped from 165 lbs to 112 lbs. My problems started in 1995, when I had mild symptoms. I was then like any other ordinary people, enjoying my work as the director of training for an international training organization. Within a few short years, I had gone through a “merry-go-round” seeking treatment from twenty-four medical doctors/specialists, plus another twelve alternative practitioners. All together, I had seen at least thirty-six of them. This “feat” alone could have driven any patient “cuckoo”. Most patients could have given up. I did not. And I now live to share with you my story. Yellowing of skin color and face. Dr. Geethan / Dr.Panir (Gastroenterologist) Panir Clinic, Jln. Sentul. Dr. Chew Yoon Heng (Gastroenterologist) University Hospital. Dr. Anand Bhupalan (Gastroenterologist) Glen Eagle Hospital. Dr. Lee Hock Bee (Gastro-Surgeon) Pantai Hospital, Kuala Lumpur. Dr. Abdul Rahim (Occup./ Environ. Health) Universiti Hospital. 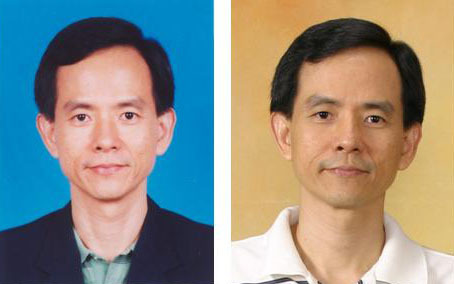 Dr. M K Lee (Neurologist) Sunway Medical Centre. 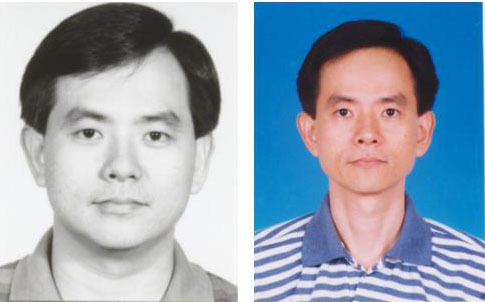 Dr. Yong Siew Leng (Gen. Surgeon) Pudu Specialist Centre. Dr. Dato Joseph Ong (Physician) Assunta Hospital. Dr. Dato Kew (Physician) General Hospital, Kuala Lumpur. Dr. Dato Ismail Merican (Physician) General Hospital, Kuala Lumpur. Dr. Kana (Physician) General Hospital, KL. In addition, I have consulted twelve alternative practitioners, e.g. sinseh, naturopath, acupuncturist, reflexologist, etc. Never a day passed by in 1999, when my thoughts and feelings were free from the torture of fear, confusion and anger. When daylight came I wished it was night, and when night arrived, I wished it was day. There was no reason for me to leave my bed, but yet in bed, there was no rest. When not in bed, I would just sit quietly in one corner of my living room and watched the world go by – pretty much like a zombie. After consulting so many medical experts and alternative practitioners, one would expect a proper diagnosis as to the actual cause/s of my debilitating condition. That is what you would expect, right? But on the contrary, a well meaning doctor ultimately wrote a letter to commit me to a psychiatrist, hoping that it would help alleviate my problem. 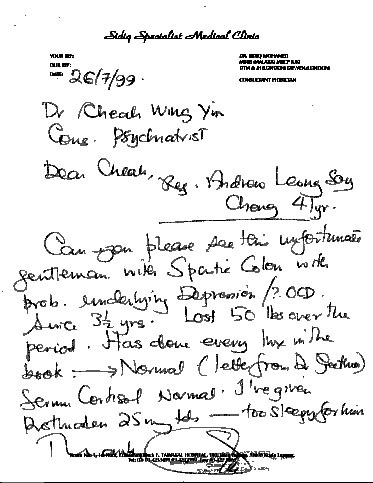 Imagine at age 41, at the prime of one’s productive stage in life, I had to be placed under the care of a psychiatrist! Here is the letter for your information. So I decided within myself, no more doctors from now onwards. I just have to treat myself … by hook or by crook … and to die my own way if I fail.Period. Then, I made a pact with God. I prayed, O God, please take me home or heal me. And if you give me a second chance, I would do whatever you want me to do. Nonetheless, it was very difficult to let go or die at that moment because my two children were in Forms 3 and 4, respectively. Finally, after much painful research, asking, seeking, and knocking, I discovered the cause of my problem which all this while had eluded detection by those medical experts. It was DENTAL MERCURY POISONING. Yes, the “silver fillings” that the dentists used to fill up the cavities of my teeth. I had nineteen of them, and they were well maintained too! Just ask any chemist, and they will shudder at the word MERCURY. The deceptive word used is AMALGAM. It consists of 50% mercury, 35% silver, 13% tin, some copper and other metals. According to the World Health Organisation (WHO), there is no permissible limit for mercury in the human body, as it is the most toxic heavy metal in the entire world. This was the culprit that actually killed me little by little, day by day, and rendered me unemployable for four long years. How to Get Out of the Rut – the Deep Poisoning? Education – that is the key to being healthy and finding a cure for my problems. I consulted with many people who care. I dug and dug, continuously learning and researching on mercury and natural health. To me, knowledge is my best prescription. Diet – raw vegetable juices, green foods, salads, raw fruits, clean water, wholesome foods. Mind – stress management, reaching out to help others, talking to God, the Creator. Avoid toxicity – do a thorough dental clean up on each affected tooth. Stay away from chemicals found in food, salt, air, (people? ), etc. Therapies – enemas, colonics, exercises, etc. Hope – holding on to God, the author and finisher of my life and faith. Never give up! Having been given a second chance, and imprisoned at home for four years, I am now being restored and I desire to reach out to people with this message: YOU DON’T NEED TO BE SICK. This, I have been doing since I got back on track three years ago. God gives you hope, we give you the health Information. But you will have to fight the battle on your own. Your health and well being is your responsibility. Others can only help. And never blame God for anything that has gone wrong. I wish you Peace, Health and Happiness, as you journey with me on this road to pursue optimal wellness – spirit, mind, and body. Is Nutrition Important for the Healing of Cancer? Sounds very scary. But, Thank God… you came out of it. This is a great post, and I specially like those tips on staying healthy, which you have given at the end. God Bless!